16 Chaos Havocs completed this weekend! 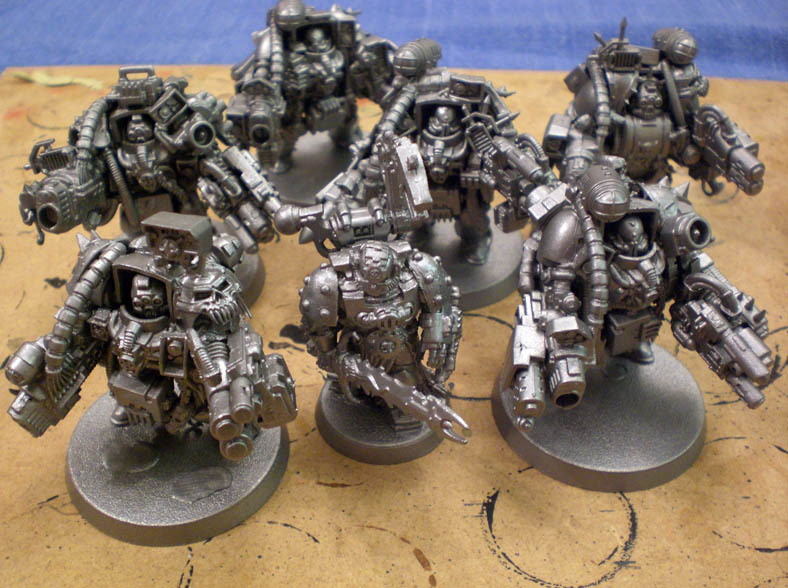 The Iron Warriors army is rapidly nearing completion. I can't wait to get these guys done so I can start work on Super Dungeon Explore and then make a start on the Tau. Seeing as the new Tau army seems to be quite a way off, now seems like a great time to get everything else done. Also, with 6th edition round the corner and a rumoured Tau Codex, everything could change dramatically for the Tau Empire, which is why I'm hesitant to write out any army lists or tactics. Because if I do, I'll probably have to rewrite it all anyway. Either way, lots of people seem to be getting their Tau armies ready for a new Codex. 6 Chaos Obliterators and an Iron Warriors Warsmith is all that stands between me and completing 2,000pts of Iron Warriors. Okay, I've still got to dip them all in the Quick Shade, flock them, lightly drybrush the flock grey and then spray varnish them. But I'm entitled to my little victories. 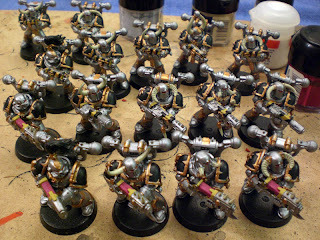 For the record, James loves the way I paint pink on my chaos plasma guns insisting that I could make an Noise Marine army look amazing. Considering it's only Warlock Purple with Bleached Bone mixed in for the highlight, I have to agree that it's quite striking. But for now I'll stick with my army of chaos Plasma/Melta madness and mugging! Stay tuned for photos of the painted Warsmith and Obliterators, then the whole army fully painted, dipped, flocked and varnished! I'll be sure to post up the army list then as well. those oblits are super badass!